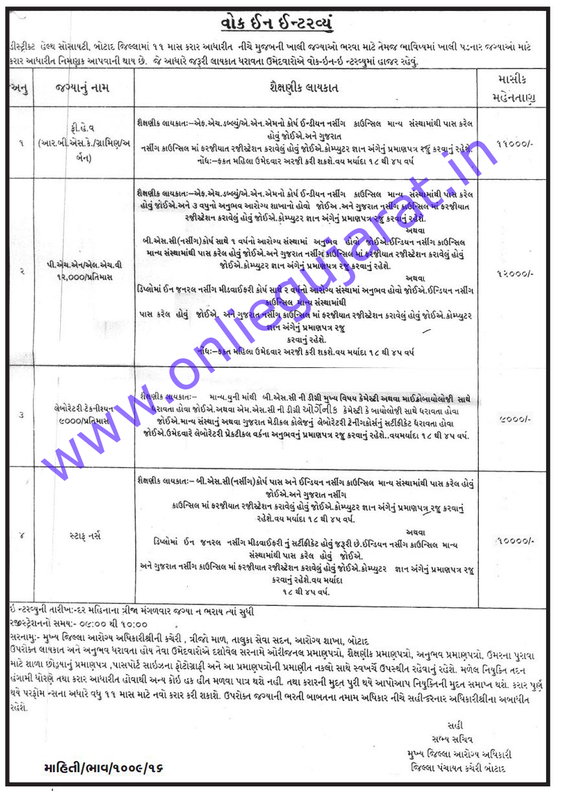 · District Urban Health Unit, District Panchayat, Botad published Walk in Interview notification for recruitment for various below mention posts in Urban Health Centre on 11 months contractual bases. Passed FHW / ANM course from recognized Institute (Indian Nursing Council). Must be registration into Gujarat Nursing Council & basic Computer course certificate. B.Sc. with Chemistry / Micro Biology in main subject. M.Sc. with Organic Chemistry or Micro Biology. To be present, Laboratory Technician training course certificate from recognized Institute or under Gujarat State- Medical College. · Selection Process: Selection will be based on interview. · How to Apply: Interested candidates can apply & reach their for interview along with bio-data, educational qualification, age proof & latest passport size photograph to given below address. · Venue: Chief District Health Officer's Office, Health Department, 5th Floor, Taluka Seva Sadan, Botad.